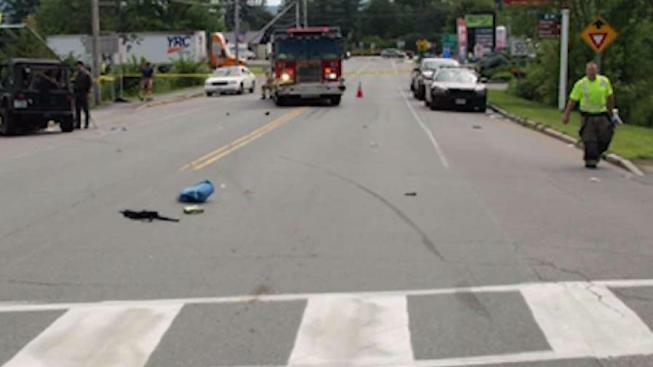 A woman is dead after being hit by a vehicle while in a wheelchair in Lancaster, New Hampshire. A New Hampshire woman in a motorized wheelchair was killed Tuesday afternoon after being struck by a Jeep in Lancaster. Police said 76-year-old Pauline Clark was in a crosswalk at the intersection of Route 3 and Country Village Road at about 2 p.m. when she was struck by a Jeep Wrangler driven by Andoni Koxarakis, 37, of Lancaster. Clark, who was in a motorized wheelchair. was taken to Weeks Medical Center where she was pronounced dead. Neither Koxarakis nor his two juvenile passengers were injured in the crash. The crash remains under investigation by New Hampshire State Police Collision Analysis and Reconstruction (C.A.R.) Unit. It's unclear if Koxarakis will be cited or face charges.